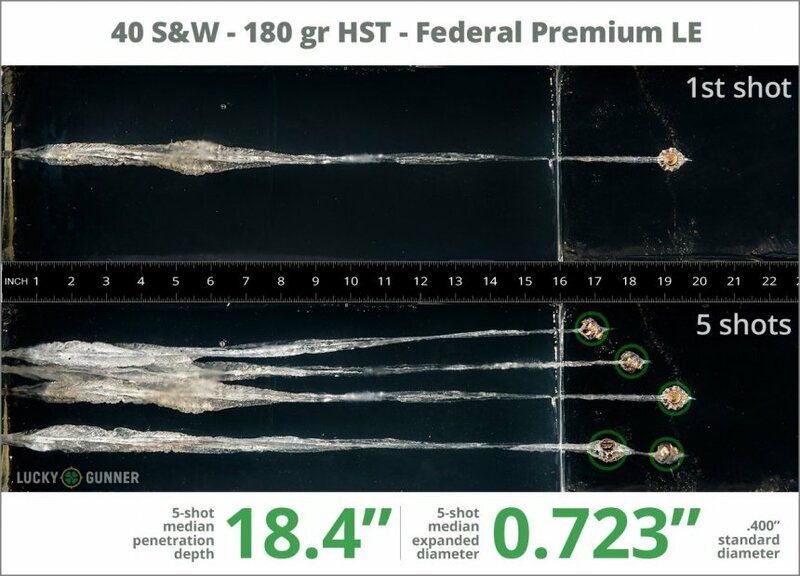 Federal's Premium Law Enforcement HST line of JHP duty ammunition offers massive expansion! This duty load has a pre-skived bullet tip which causes the bullet to expand into large petals that cause a large permanent wound cavity. 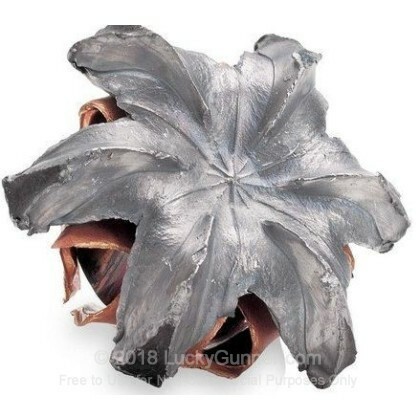 The unique design of this bullet actually forces the lead petals during expansion to protect the copper petals behind them. This results in increased weight retention allowing it to still achieve deep penetration through a variety of barriers prescribed by the FBI test protocols. This product is brand new, nickel plated brass-cased, boxer-primed, non-corrosive, and reloadable. This is top of the line, American-made defense ammo made by ATK (same company that makes Speer Lawman, CCI, Blazer Brass, etc). This product is designed for Law Enforcement and occasionally made available to the general public through police trade-ins. - it doesn't get any better. After firing five rounds of Federal 180 gr HST from a Glock 27 into synthetic ballistic gelatin from 10 feet away through four layers of fabric to simulate clothing, we then measured the expansion and penetration of the bullets for this .40 S&W (Smith & Wesson) load, which you can see in the chart below. 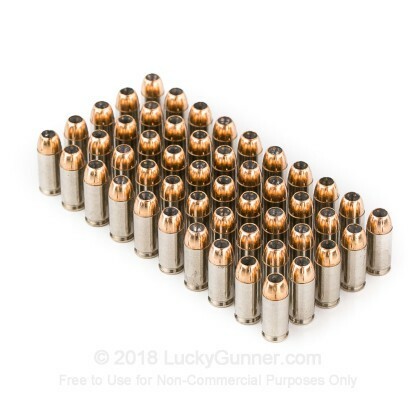 Finally, if you'd like to see how this Federal load compares to other .40 S&W (Smith & Wesson) loads, check out the diagrams at the bottom of the page. Want to know more about our ballistic gelatin testing and self-defense ammo? Check out Lucky Gunner Labs for more information. How do the results for this Federal .40 S&W (Smith & Wesson) compare to other 40 S&W Ammo? 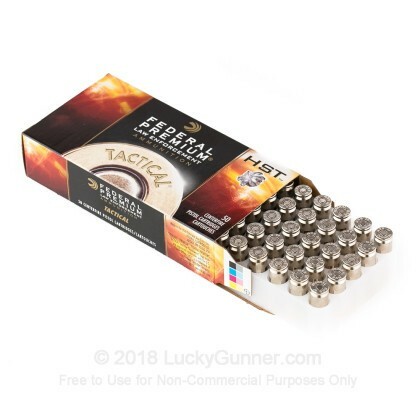 0.89" This ammo: 0.72" Min: 0.39" Median: 0.65" Max: 0.89"
18.4" 0" 9.8" 16.5" 32" This ammo: 18.4" Min: 9.8" Median: 16.5" Max: 32"
Federal HST = best one can buy. Every caliber/every load, simply the best. it's a great rounds. many Law Enforcement agencies run this ammo. It shoots well.The only downside is that it is priced a bit higher than competitors comparable ammo. i typically run this or Hornady Critical Defense. Cycled perfect. Great grouping from Sig P320SC. Can always depend on Federal's products for defense, hunting, and target shooting. Best price and fastest shipping from Lucky Gunner. Will purchase again. As good as I have shot. Consistent, gentle recoil and amazingly accurate. An amazing round - the HST is unparalleled in ballistic performance. Federal definitely got it right on this round. This is my perfered ammunition for my seven .40 s&w firearms that I own. Performs flawless. I have started using this round for my self defense ammunition for all of my .40 S&W calibered handguns. Clean shooting, accurate, and feeds dependable. 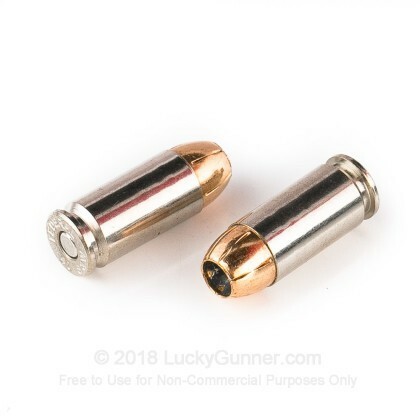 Luckygunner.com always has great deals and service! 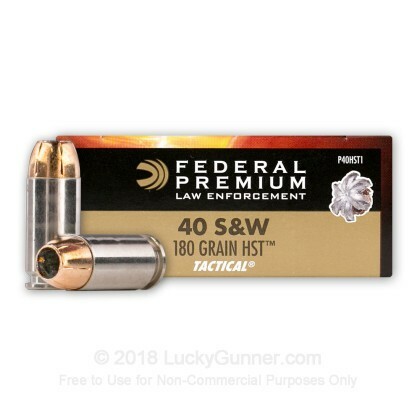 The 180 gr HST JHP - Federal Premium Law Enforcement is the best defense round for the .40 S&W hand down. My Glock 22 performs flawlessly with the 180gr HST JHP so it is what I always carry for work with confidence. I also use the HST for my CCW pistols in 9MM and .45 ACP as well. LAW ENFORCEMENT ISSUE FOR A REASON. This is a common LE issue round for a very good reason, feed, function, barrier penetration, expansion, top of the line performance. Pricey but so worth it. This particular load is my dept's current .40 cal duty load. We have fired them into everything and they perform exactly as advertised. The price is what makes them a 4 star purchase instead of 5. Perfect defense / duty round. Lucky Gunner is one of the few places that routinely stocks it at a reasonable price, and they are fantastic to work with, and a first class operation. Exactly as advertised, promptly shipped Thank YOU!! Fired 200 rnds perfectly. Accurate. Clean. Will buy it again at the right price! Good price, great product, shipped fast. I am a fan of HST. Best price to value. Best ballistic reports. This has been my second purchase at Luckygunner.com and the folks here do an outstanding job of making sure my orders have been placed promptly and correctly. 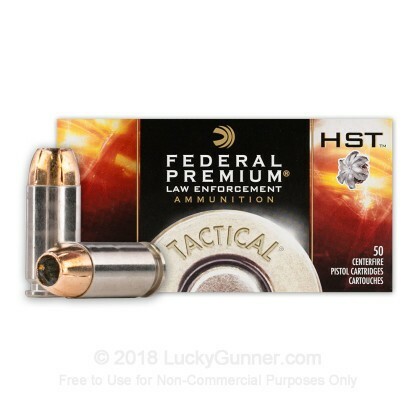 Federal HST in my opinion is THE best ammo to use for self defense due to its availability, extreme reliability, expansion, penetration and consistent performance regardless of which caliber or firearm I have used. Currently, my favorite loads are the 180 gr. 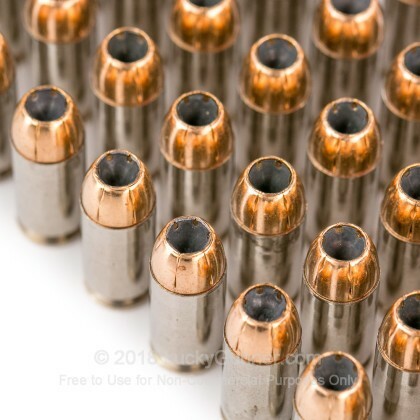 in 40, 147 gr +P in 9mm and 230 gr +P in 45 ACP. The presentation and pristine condition that the box and ammo was in when it arrived at my doorstep along with the fact that Luckygunner always has this brand in stock with their prompt delivery makes buying ammo online from them a no-brainer!!!! Two thumbs up for the folks here and I will definitely be buying more ammo from them once I replenish the leaves on the money tree. One of the best performing 180gr hollowpoints. Performed better than the old Hydra-Shok. Law enforcement and gov't agencies use this for a reason. Feeds and functions perfectly and expands consistently and beautifully. Nice ammo, will put bloody great holes in the bg. And great service from Heidi. I will be doing my online ammo shopping here. I have made two purchases now with luckygunner. I am extremely happy with their business. I am definitely gonna spend my hard earned money with them again! Nice accurate ammo for my home defense use. From the price to the performance I can't say enough good things about Federal HST. It says something when you have to 'settle' for PDX1 when HST is out of stock. When this ammo is available I jump at it, because I know it flies off the proverbial shelves. I feel safer knowing that I have 180gr HST loaded as my Defensive Rounds. Lucky Gunner, Great Price, Fast Shipping! We also have this 40 S&W - 180 gr HST JHP - Federal Premium Law Enforcement - 1000 Rounds ammo in stock in a bigger quantity.